A freight elevator, a type of heavy duty elevator, is also called a goods elevator. It is a low speed elevator, and is specially used to move goods between floors of a building. We are a reliable freight elevator manufacturer in China. Our T5-E goods elevator is designed for customers who look for a high-quality and cost-effective elevator. This freight elevator is built tough to stand up against heavy use for years. Based on T5, it is an economical product of utility with modification in some configurations. 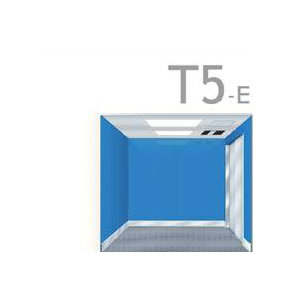 Our T5 freight elevator is of high configurations and complete functions, and is built with dependable quality to last a lifetime. We invite you to compare this goods elevator to any competitor, and you will find it superior in design and quality. As an experienced goods elevator manufacturer and supplier, We has received ISO9001:2000 certificate. Located in Wujiang. Suzhou City, Jiangsu Province, China. Wujiang is the intersection of Jiangsu Province, Zhejiang Province and Shanghai City. It has the charming scenery and transport facilities. It is close to Hongqiao International Airport. We enjoy convenient transportation by land, sea, and air. So we can deliver our elevators quickly and cheaply. Our primary products include freight elevators, observation elevators, home elevators, and escalators. They have the advantage of reliable quality, great durability and high performance. Please contact us for more product information. We are looking forward to serving you.